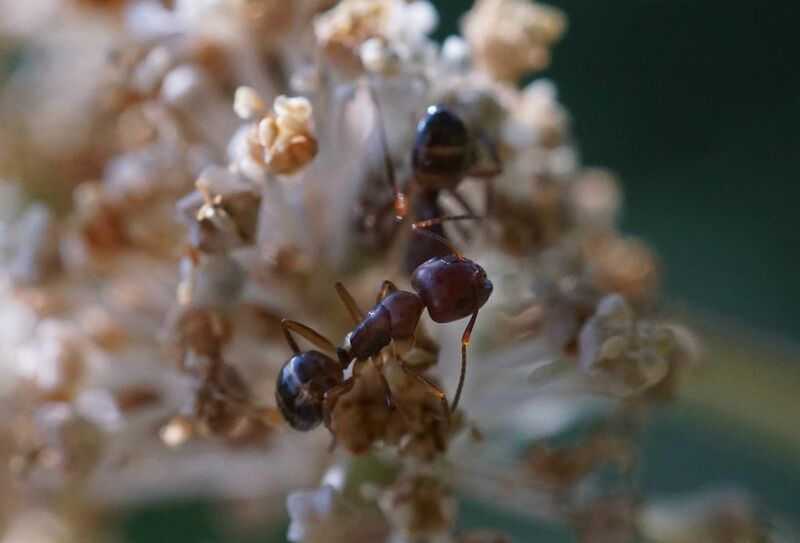 This week I got to explore the ants at the Mt. Cuba Center, a former DuPont estate located in Delaware. Today it's a ~600 acre native plant preserve of which about 45 have been turned walkable gardens. PLEASE NOTE: this is not a place you would ever bring a shovel to dig for ants. It is an actual garden, you need to stay on the paths, there's no flipping logs or rocks or ripping the bark off of trees as is typically done when looking for ants, and of course this survey was done with permission. Samples collected are going to be shipped off to AntWeb.org, run out of the California Academy of Science, and School of Ants, a citizen science project based in Florida. 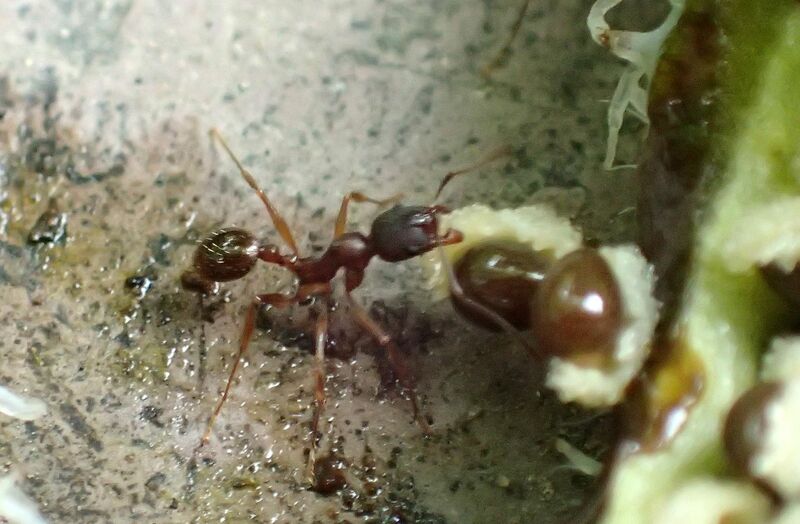 Ants Seen From Past Trips but not Collected: Prenolepis imparis, Dorymyrmex sp. 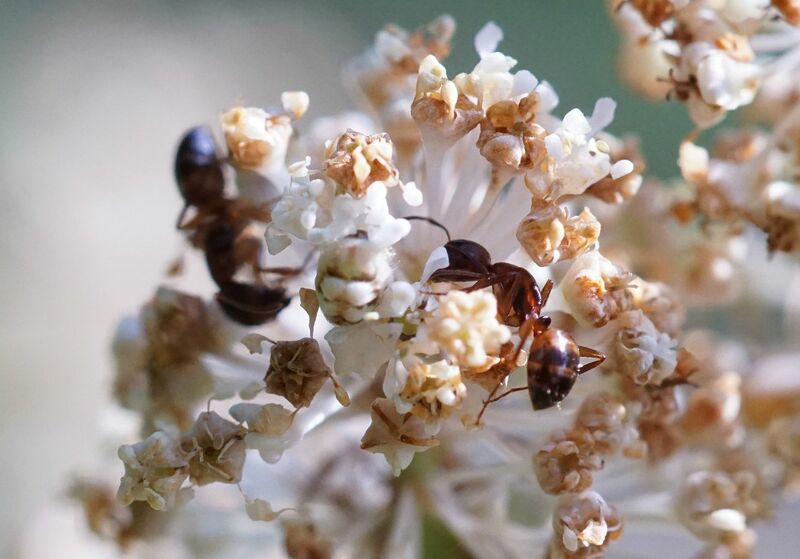 Observations: (1) With hundreds of colonies of Formica subsericea in their meadow one slave making species or Polyergus colony could seriously change the power dynamic of their meadow garden. 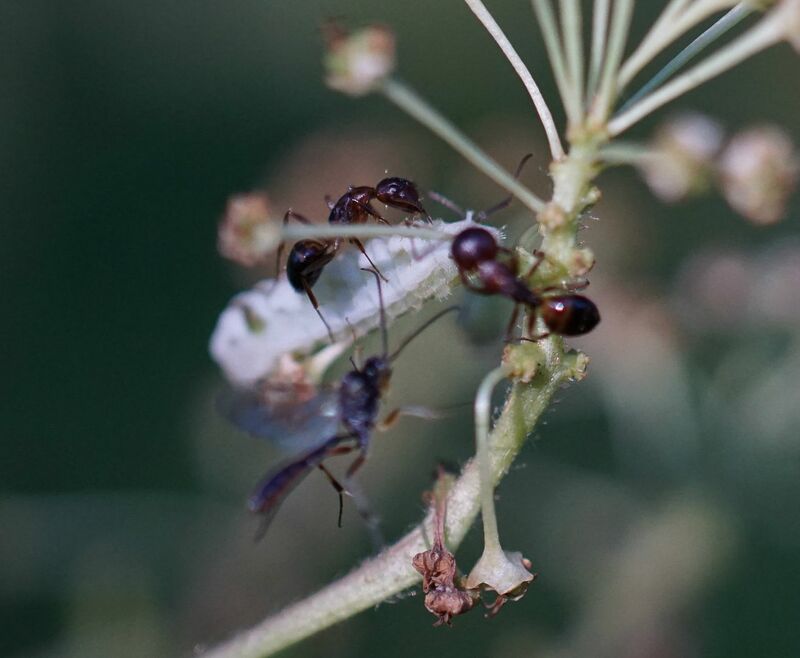 The invasive Tetramorium caespitum had surprisingly uncommon. 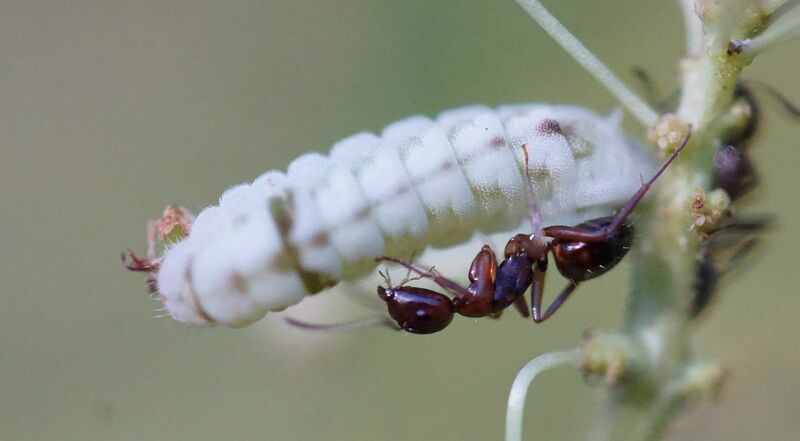 (2) Digging into the soil and flipping logs especially in the wild woodland areas would likely yield additional species such as Lasius clavigar, Lasius interjectus, and Lasius umbratus. All three are subterranean aphid farmers that rarely come to the surface for food. Further diligence would likely produce species of Strumigenys and Proceratium as well. 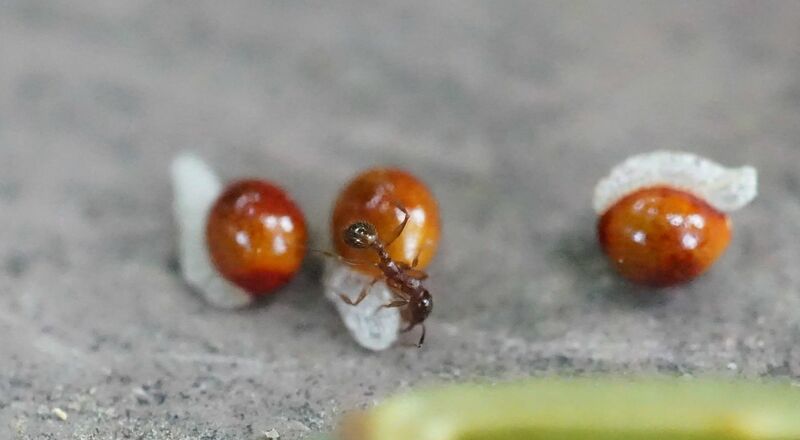 (3) It's odd no Crematogaster species were found. Likewise none of the smaller Camponotus species were observed. Tapinoma sessile should have been more common too given the amount of leaf litter and dead wood used in the gardens, I'm not even certain it was collected or that I even saw it there. All three are notorious nectar thieves of flowers so it's strange to have not seen any of these. 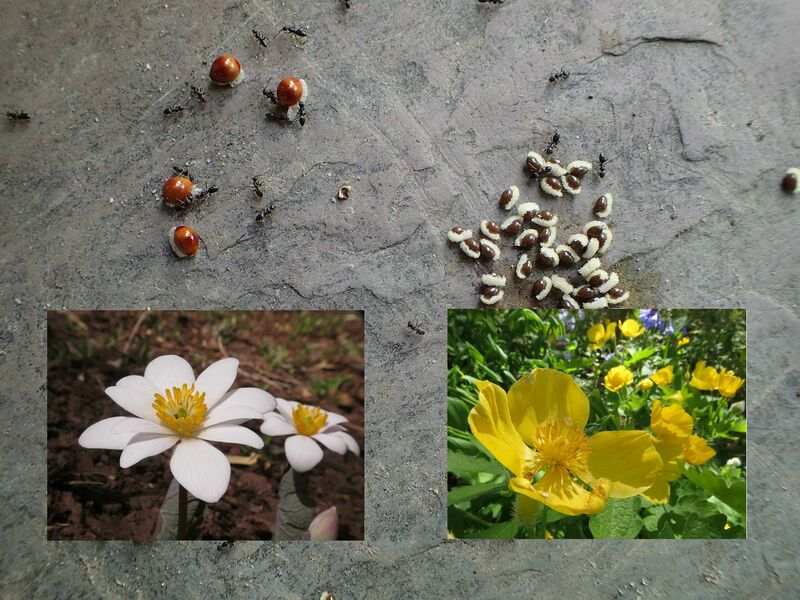 This week Woodland Poppies and Bloodroot went to seed. 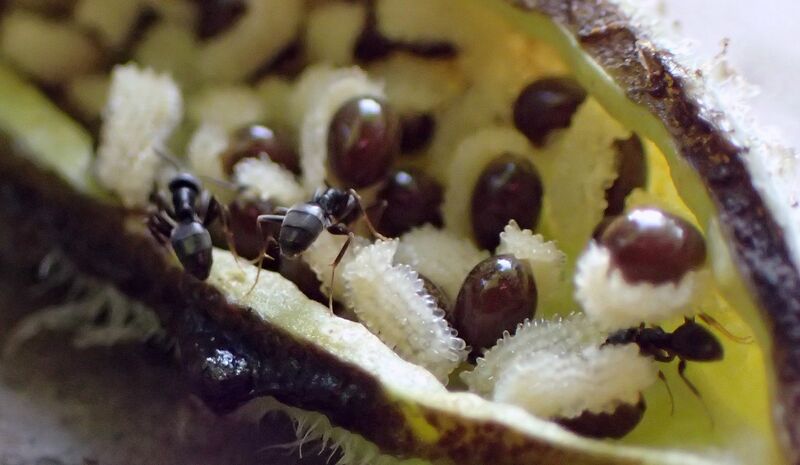 Both plants have elaiosome on their seeds which entice ants into dispersing them. Twinleaf also went to seed but none of my plants flowered at the same time as one another. Presumably the lack of crosspollination means the packets of elaiosome on the seeds are smaller, and they're already pretty tiny on these plants as it is. 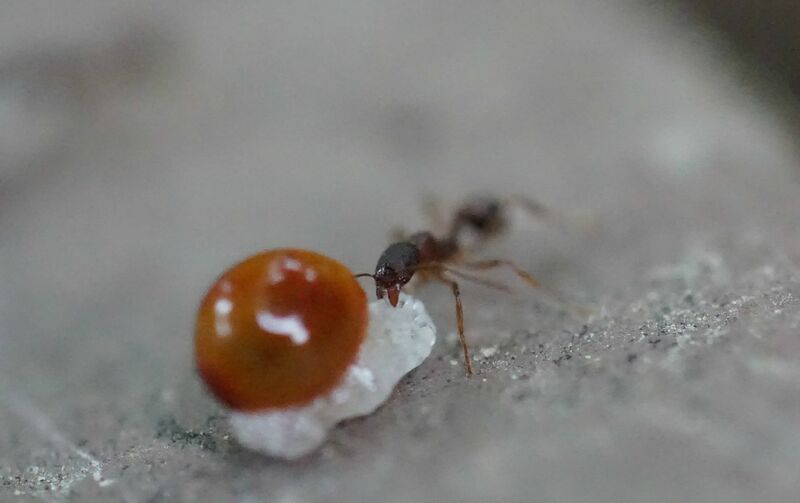 Pictured above is Crematogaster cerasi which isn't strong enough to physically lift the seeds. Even the seeds that fell out of the pod naturally from the wind blowing it around were practically unmoved. So the focus was on the Bloodroot and the Woodland Poppy. Both have great big packets of elaiosome on their seeds. I would love to include Twinleaf one year but they're tricky; seedpods can seem ripe but the seeds inside might still be soft. Bloodroot seeds are about the same size as Twinleaf, and the packets of elaiosome are huge by comparison. Woodland Poppy seeds are smaller but also have tons of elaiosome on them, though they look different. Actually the seeds to this pod are just shy from being ripe as they're normally black colored, but these should be dark enough that they'll still grow. ... Aphaenogaster rudis. This ant for the most part doesn't have a common name. In "A Field Guide to the Ants of New England" they're referred to as "The Rough Aphaenogaster" which refers to a rough spot on the thorax that set it apart from other Aphaenogaster. The problem here though is the genus name is in the common name so why bother? Also A. rudis has been found to be a HUGE species complex! I forget the exact number but I recall a study saying there was something like 8 or 16 nearly identical-looking species that all fall under the A. rudis blanket. Each one has a different number of chromosome in their DNA so you actually have to look at their blood to tell them apart. I don't have access to that kind of tech so for convenient sake they're all A. rudis, and to be honest they're all pretty similar to one another. 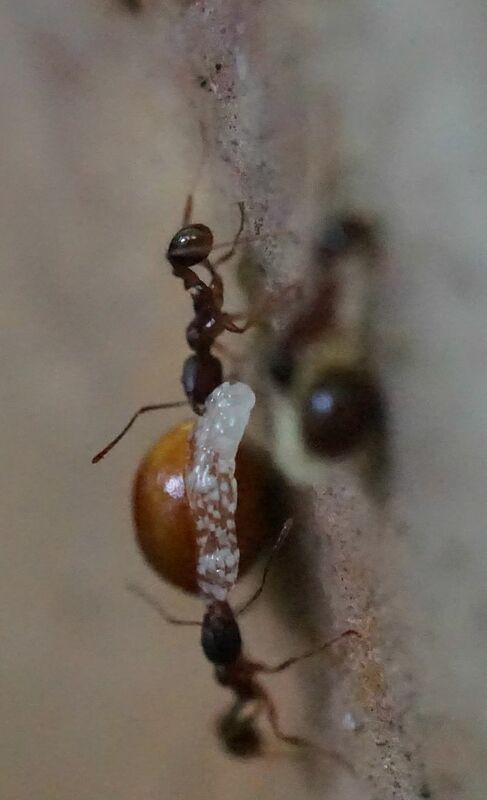 I've found a few colonies before that have multiple queens and others that only have just one, some colonies seem to divide, but all pretty much nest in forests with colonies of ~2,000 ants. 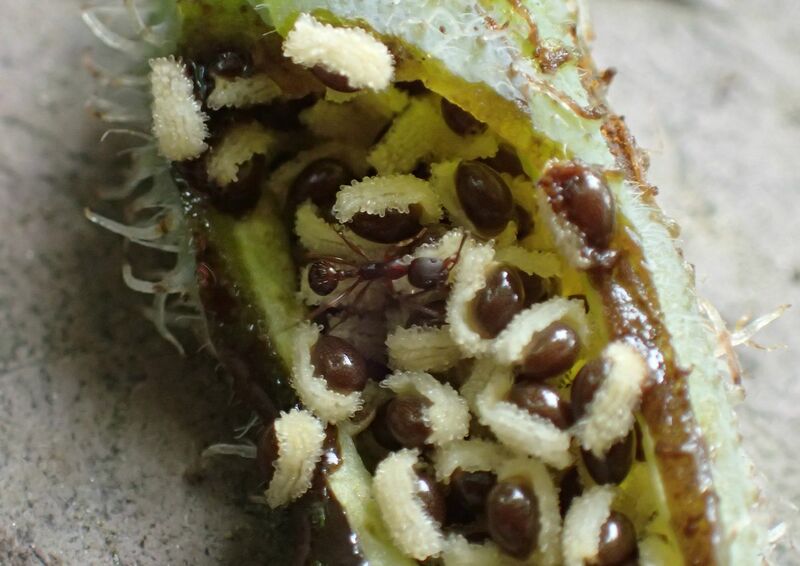 Tapinoma sessile are either incapable or unwilling to transport Bloodroot seeds. 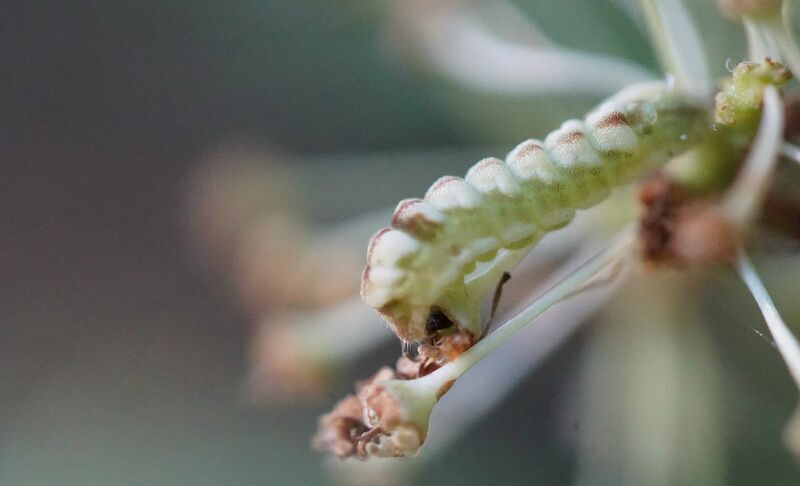 The seeds overall are too large and bulky for them to lift so they spent the whole time just nibbling at the elaiosome. They started to bite pieces off and carrying them back to the nest bit by bit. 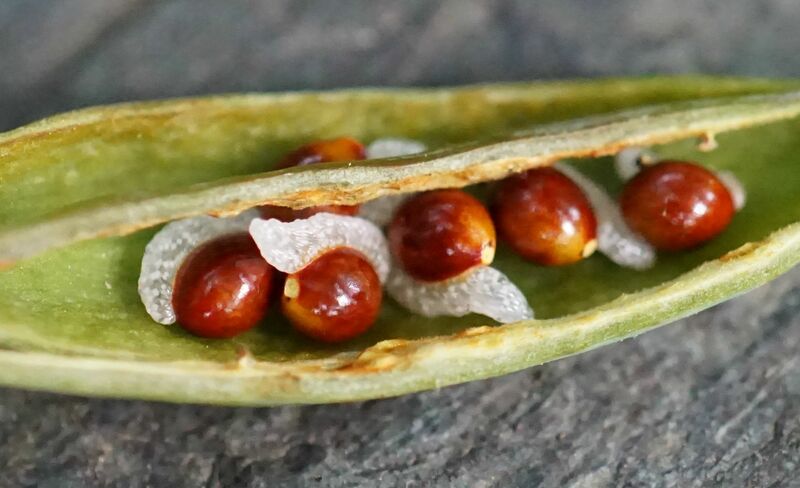 At no point did they actually move the seeds other than to accidentally jostle one or two of them free of the pod. Aphaenogaster rudis on the other hand was more than happy to haul the seeds off. They would latch hold of the elaiosome and drag them back to the nest that way. 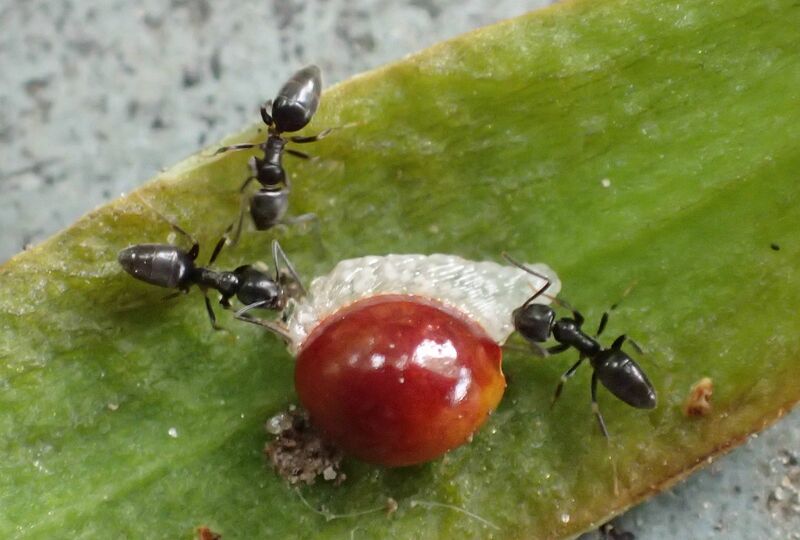 With Woodland Poppy, I was amazed to see Tapinoma sessile workers actually carrying them back to the nest. 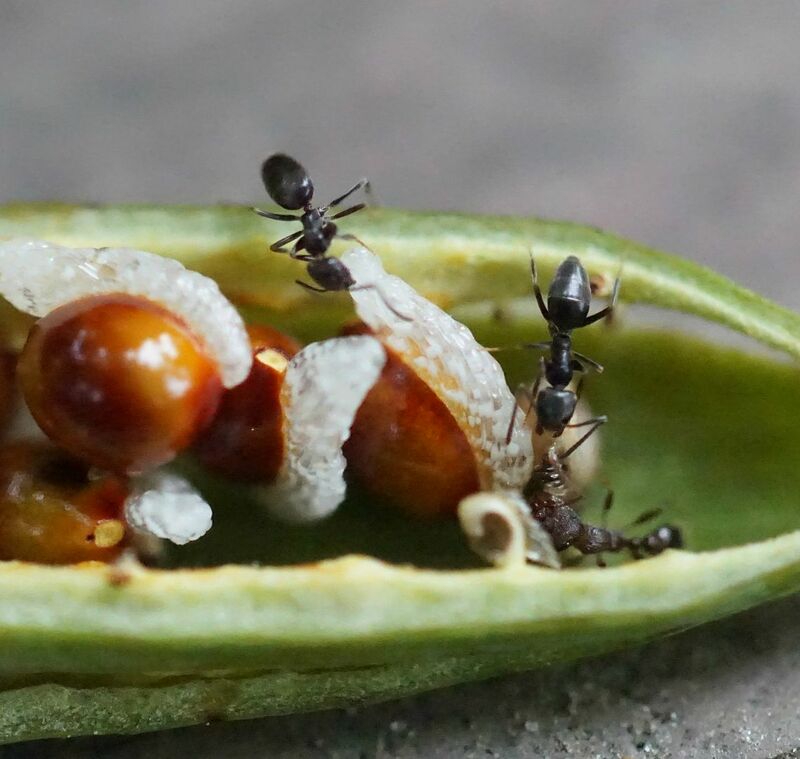 Most of their time was spent on removing the elaiosome from the seeds within the pod but several of the workers actually did disperse them... the colony is nesting in a soliar light but they're still dispersing them. 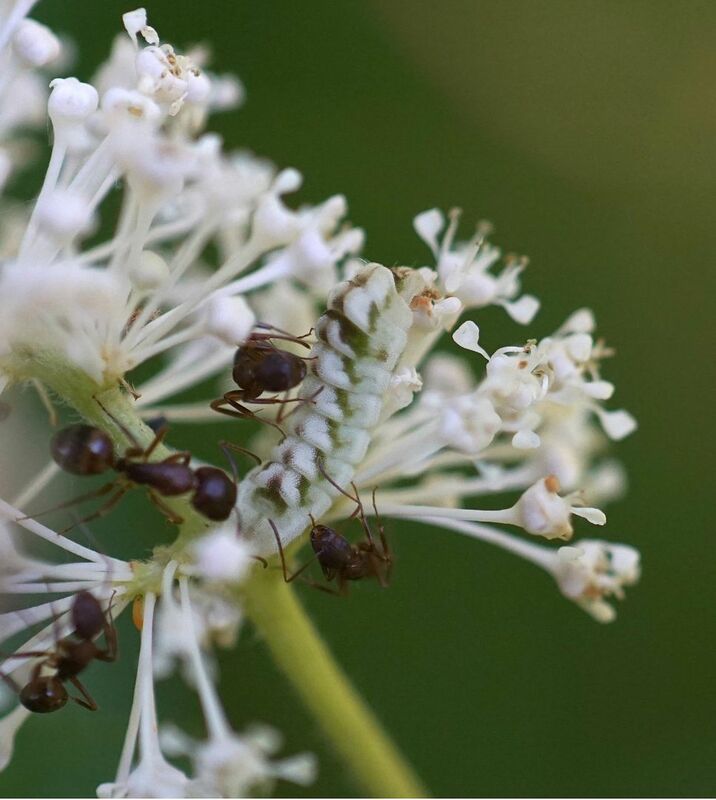 This is a native ant species so it's not too surprising to see them dispersing a native plant species but there is still a problem. 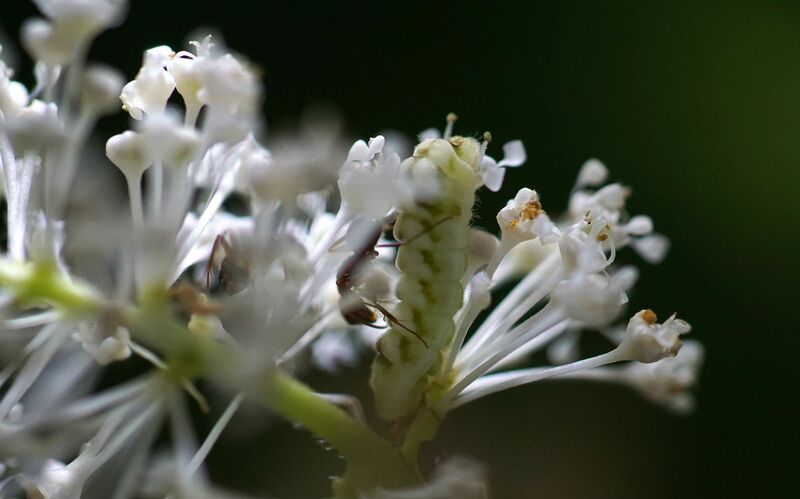 The Odorous House Ant is often the little black ant seen running around your bathroom and kitchen counter. They nest opportunistically in mulch, under tree bark, and in man made structures. 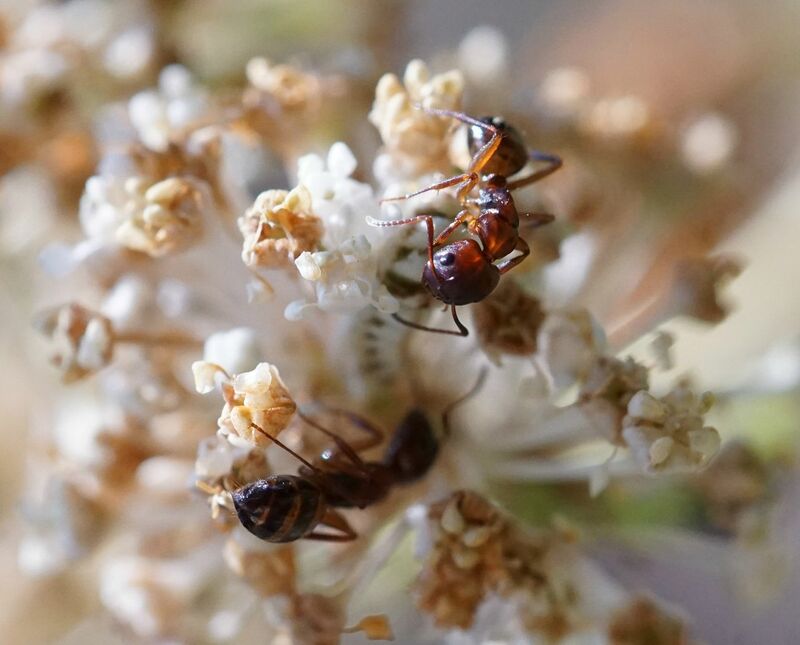 So they're not the best ant to be dispersing seeds because they can end up in the walls of your home, in foundation bricks, or under loose bark, but also in the mulch of your garden, and in flower pots. So it's the flip of the coin as to whether they end up in a spot they can grow. 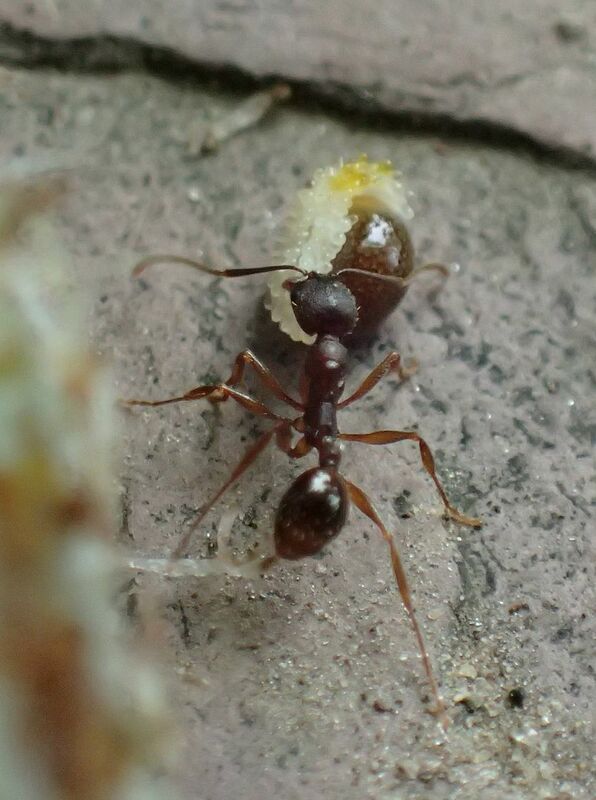 Aphaenogaster rudis is better at the task. They're generalist scavengers more in the habit of bringing food items back to the nest. They nest under logs, in leaf litter, or along clumps of grass. At no point during my observations did I witness any try to remove the elaiosome from the seeds outside of the nest. Actually shortly after bringing them into the nest the seeds were quickly discarded out to the colony's midden (trash) pile which was hidden among leaf litter. Midden piles are where ants put their garbage. Old insect carcasses, dead workers, spent cocoons, general roughage and things to be discarded all get piled up here. In deserts of the South West they're very noticeable around ant nests but here in the forests of the North Eastern United States they're often hidden under leaf litter. 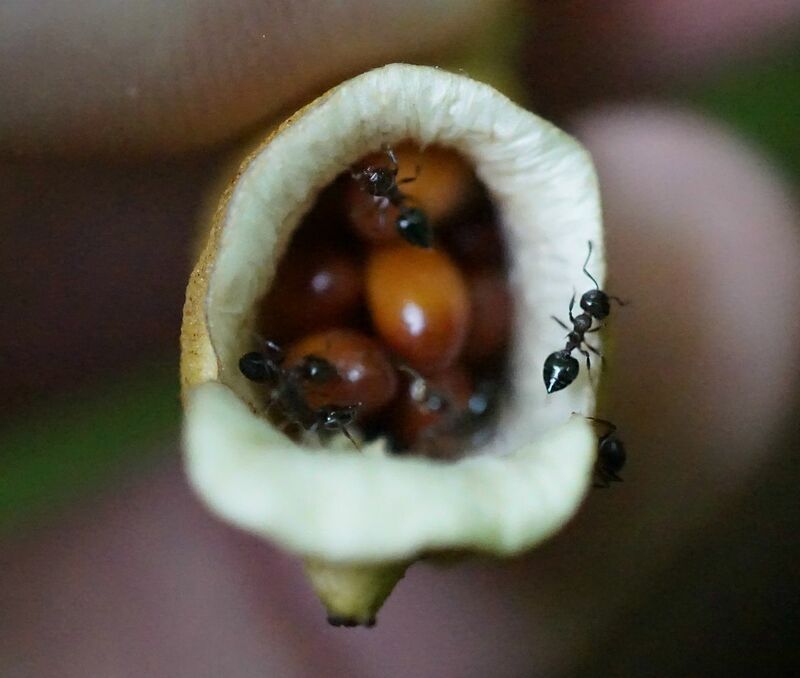 Overall were it not for the ants dispersing these seeds they wouldn't have gotten very far. New plants would try to germinate just inches away from the old ones and the patch would move at a snails pace and only on the rarest of occasions would they travel up hill. 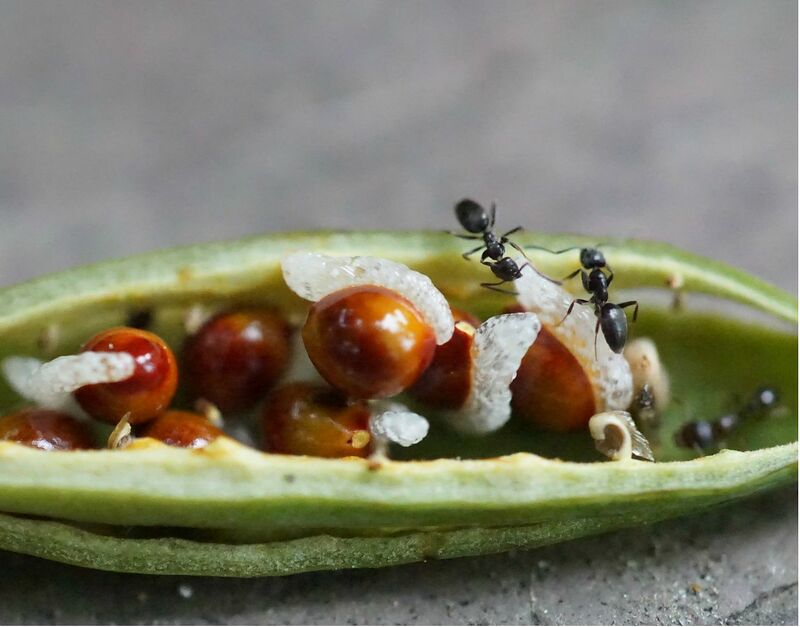 Thanks to the ants carrying the seeds off, even if they're dropped or discarded shortly after, new populations of these plants can spring up to 24' away, potentially more if colonies fight over them or raid the midden piles of other colonies they often do for dead ants. 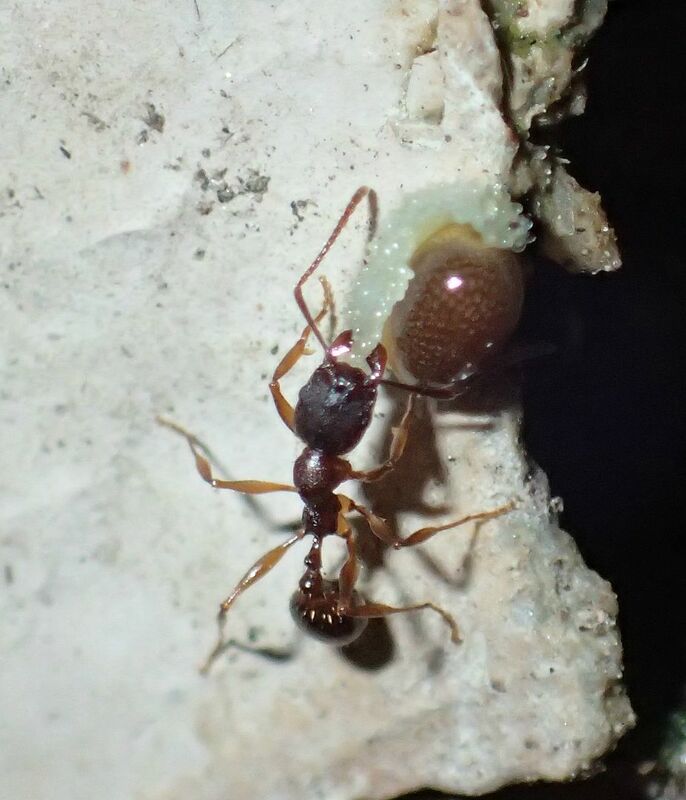 Prenolepis imparis - single worker that did not recruit other nest mates. Nylanderia flavipes - even smaller than Tapinoma sessile in size. Barely able to remove elaiosome. did not disperse seeds. 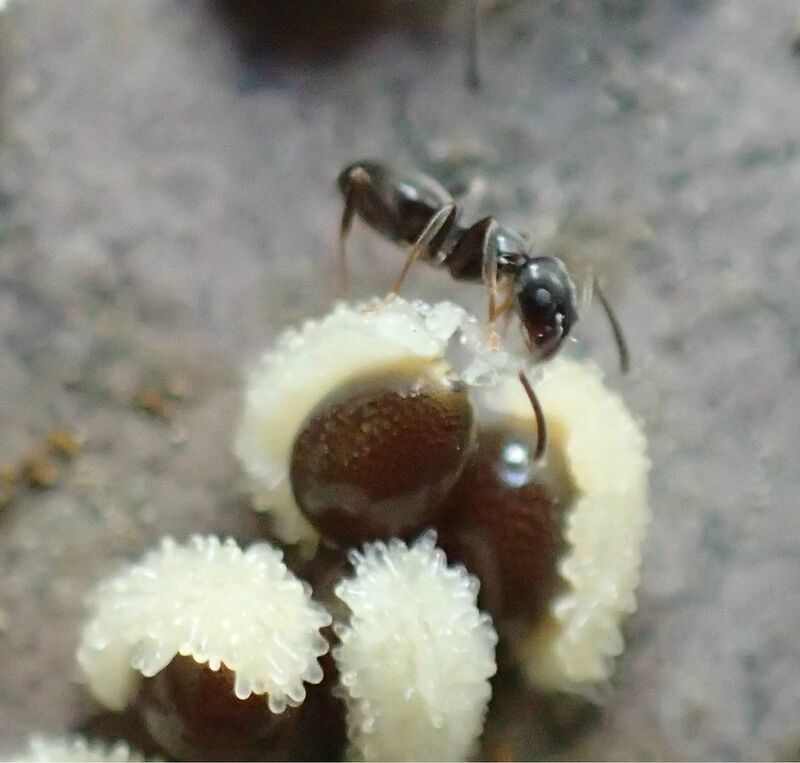 Temnothorax curvispinosus - even smaller than Nylanderia flavipes. Incapable of recruiting nest mates as they don't use chemical trails.